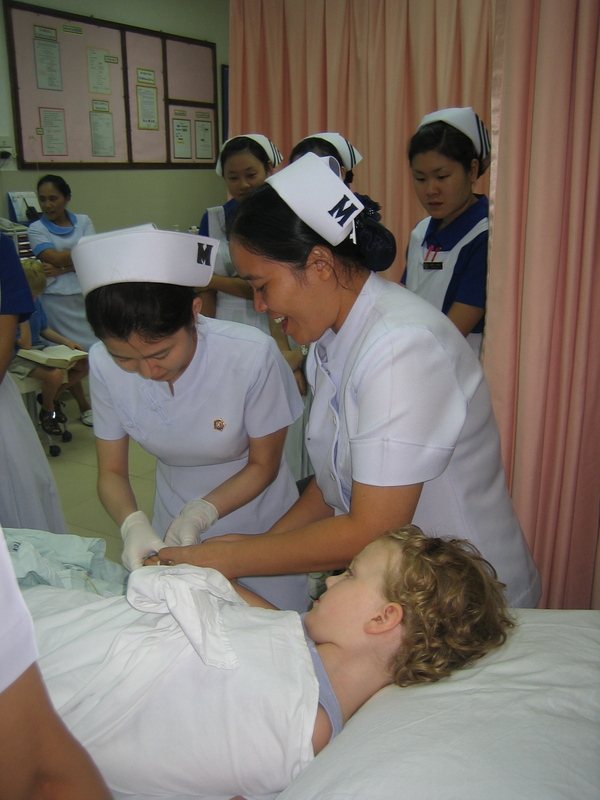 As a preface, during my pregnancy, childbirth, sinus infections, and ordinary minor illnesses, I have had nothing but wonderful experiences with medical care in Chiang Mai. In short, I trust Thai doctors. Within a few weeks of us arriving here, Camilla grew a huge wart on the bottom of her middle toe, and another small one on her hand. Armed with a piece of paper with the word for wart printed in Thai (which is pronounced “waht”), I blithely took the kids off to the dermatology clinic at McCormick Hospital—founded by nineteenth-century missionaries–to get the warts frozen off. 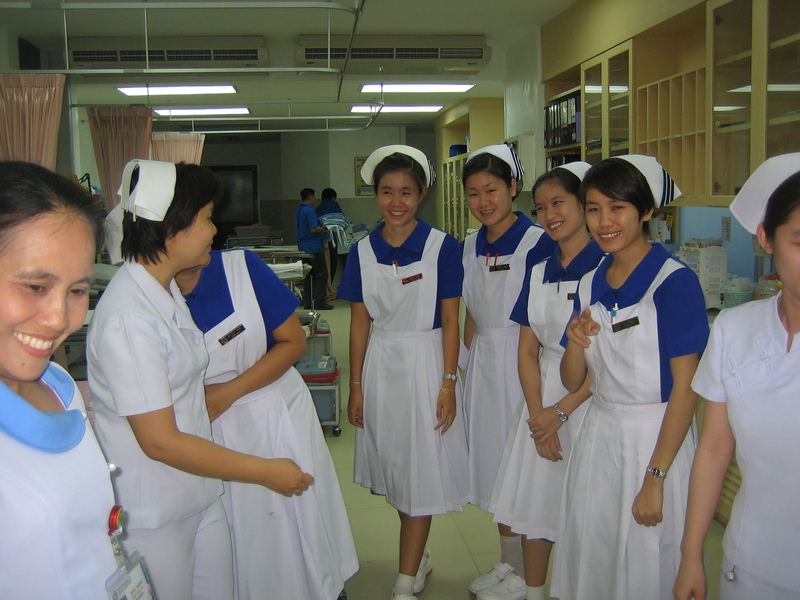 The doors swing open onto a bevy of seven nursing students, two nurses, one surgical assistant, and the doctor. The nurses and students all immediately fall upon Camilla, cooing and petting and squeezing her. They pull a pink curtain around a gurney, and lay two sheets on it. Up she goes, lifted by all the students, who lovingly straighten her out and remove her sandals. She is smiling up at them, trust embodied. 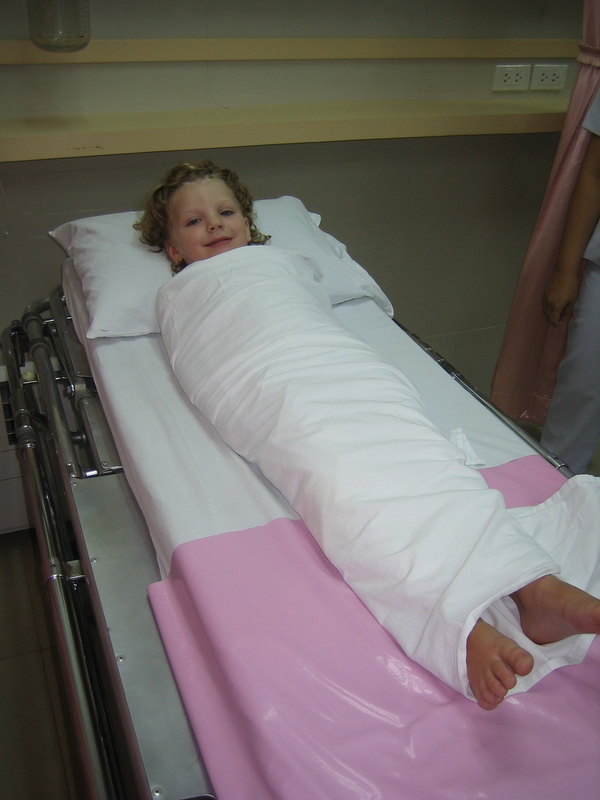 They then wrap the upper sheet around her, immobilizing her in the wrapping. We swaddle her or her doll Baby sometimes at home as part of goodnight rituals, so it doesn’t occur to her that this might portend something unpleasant. Then the doctor comes, all scrubbed and masked, and ready to go. I’m standing at her head, explaining all I can. It all seems very drastic, but if they want to err on the side of caution, I’m all for it. They dress her foot, and move onto her hand. At this point, I hesitate—it’s a tiny wart on the back of her hand, and the possibility of scarring suddenly occurs to me—but it’s too late now, or at least it felt like it was too late. So she undergoes the second round, although this she watches with some concern. But it’s over, and she’s still smiling. The nurses bandage her up, pronounce her “gaeng mak” (so good, as in behavior), kiss her, unwrap her swaddling, applaud her as she climbs down from the gurney, squeeze and fondle her some more, and wave us goodbye. The only thing they don’t do (and I’m sure it was only because they’re not allowed in the ER) is to photograph her with their cell phones. We are escorted out by a modified bevy–only three nurses and two students—to await our bill ($90, including the oral antibiotic and the antibiotic ointment). Camilla is still smiling; Ascher is moderately traumatized. On the bottom of each and every plastic bag holding medication is printed these words, “We prescribe medicine, but Jesus Christ is the healer.” Later, I notice that the antibiotic ointment is for ophthalmologic use. I don’t know how Christ feels about off-label uses. I hadn’t anticipated the amount of care an open wound on the bottom of the foot would require in the tropics: those open sandals, nasty puddles in the market place, dust and dirt irrigated by sewage run-off! But I figured that working to keep it exquisitely clean under the circumstances was the least I could do, having gotten her into this fix, and I worked off my residual maternal guilt by taking such good care of both sites that they healed up in a few days. The wound on Camilla’s hand turned out to be tiny, no worse than a badly-scratched mosquito bite, and, with the voice of my own mother in my head, I continue to enforce a scar-prevention regime on the site. I wish there were a clear lesson to be learned here, but I can’t generalize from it. I think maybe I’ll just stay away from McCormick, and, next time we go to a hospital, I’ll bring along the fluent Thai speaker to whom I’m married. Next time, try the duct tape cure. It works surprisingly well.